Keith is responsible for the music and technology on Sunday morning, video production, visual arts, including photography and graphics, social media, environments, and special services. Keith transitioned to full time staff in January of 2017. Keith felt God’s call to offer his gifts and background to serve God’s kingdom. His love of music and visual arts has helped create a great environment at River Ridge. 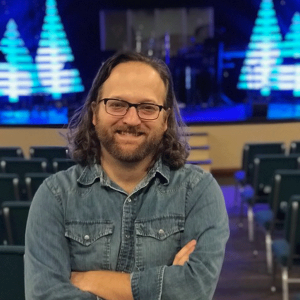 Keith is passionate about presenting the message of Jesus in a way that people can connect with whether they grew up around church or not. Keith grew up in Hurricane, WV and has a BA in History and Political Science from West Virginia Wesleyan College and a JD from West Virginia University. He worked full time as an attorney for 7 years at a large West Virginia law firm. When not on stage or behind a computer, Keith enjoys being outdoors with his wife, Holly, and their 3 young children, hiking, biking, fly fishing, camping and exploring all the amazing natural beauty found in West Virginia.